The people of mainly Muslim Tajikistan have voted on a proposal to ban religion-based parties, in a poll set to strengthen the president's power. Emomali Rakhmon has ruled the ex-Soviet Central Asian republic since 1992, surviving a civil war which ended in a deal with the Islamist opposition. Moves to ban the opposition Islamic Renaissance Party began last year. The results of the referendum, which also asks for presidential term limits to be lifted, are due on Monday. According to state news agency Khovar, turnout had reached 88.3% two hours before polling stations closed at 20:00 (15:00 GMT). 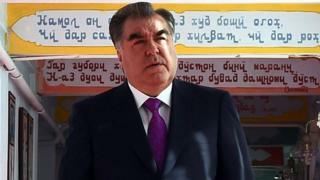 Elections in Tajikistan have long been criticised by outside observers for failing to meet basic democratic standards. The referendum also proposes lowering the age limit for running for president from 35 to 30 - a move that would theoretically allow Mr Rakhmon's son Rustam, who is 29, to run for office in 2020. The three points are contained in a parliamentary bill on amendments to the constitution. The single question on the ballot form was "Do you support the amendments and additions to the constitution of the country?" Tajikistan is one of the poorest countries in the region and relies heavily on Russia, with remittances from citizens working abroad - mainly in Russia - making up half of the country's GDP. Since the power-sharing agreement that ended the bloody civil war in 1997, Islamists have been gradually pushed out of the government. Fears have also grown that the Afghan conflict could spill across Tajikistan's border. Emomali Rakhmon has been in power since 1992, and has managed to increase his power by cracking down on political dissent and freedom of expression. Mr Rakhmon has substantial public support - and his rather serious face can be seen on posters across Tajikistan. People sing his praises and dedicate poems to him. And huge crowds turn up to presidential rallies - although attendance is obligatory for state employees. Mr Rakhmon's supporters are grateful the civil war of the 1990s is over - but life is not easy for most Tajiks.